Students are always encouraged to participate in a variety of social and recreational activities, which are organised throughout the year. Various academic societies and cultural clubs on the campus help in promoting to the overall personality development of the students. The University encourages the students to promote their physical and mental level through various sports and games. 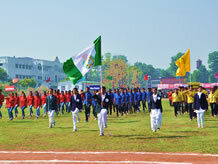 Facilities are provided to students, who show interest in the sports/games of their choice, under the sharp supervision of qualified instructors. Sports facilities available at SHUATS, include basket ball, tennis, badminton and volleyball courts. The Institute also has well maintained football, hockey and cricket fields, a running track of 400 meters, a table tennis room and a well equipped Gym. The faculty members encourage the students to enhance their interest in various games and sports and to inculcate a competitive spirit in them. Inter house matches are organized throughout the session, the performance of each house team is recorded for the overall championship. courts. The Institute also has well maintained football, hockey and cricket fields, a running track of 400 meters, a table tennis room and a well equipped Gym. The faculty members encourage the students to enhance their interest in various games and sports and to inculcate a competitive spirit in them. Inter house matches are organized throughout the session, the performance of each house team is recorded for the overall championship. Sponsored by Ministry of Youth Affairs and Sports, Govt. of India] The National Service Scheme (N.S.S) was intiated in 1969-70 with a view to promote social conciousness and develop a sense of responsiblility as well as a sense of discipline and diginity of labour amoung youth of the University. Regular activities and ten days special camps in diffrent nearby villages are organized. Girls actively involve themselves in educating village women with child health and active participation of women in transfer of technology in the adopted villages. During their stay in the villages students get themselves involved in the village activities. Various rallies, programmes etc.. are organised to create awareness about matters of importance for rural and slum populations. Various rallies, programmes etc.. are organised to create awareness about matters of importance for rural and slum populations. The University has a sub-unit (1/17 Coy.) of N.C.C. under the unit (17 U.P. Bn. NCC, Alld.) Students of our University voluntarily join this organization with the spirit of serving the nation. Regular camps are organized at the Battalion level. The students are trained to develop leadership, character, sportsmanship, confidence and to create a force of trained and disciplined youth which could be utilized for the nation in case of an emergency. It is the conviction of a Christian Institution that the integration of work with worship is essential in the life of any community. Daily devotions are held in the University Chapel, “The Chapel of Brotherly Love”, thus helping the Christian students to inculcate the habit of daily Bible reading and Prayer. They are also encouraged to take part in conducting the Chapel and Church services and shouldering Church responsibilities for cultural and spiritual advancement. Students from other faiths are welcome to attend the daily devotion and Sunday Chapel Services of their own free will. spiritual advancement. Students from other faiths are welcome to attend the daily devotion and Sunday Chapel Services of their own free will. Society of Agri. Econ. & Agri. Busi. Mngt. The Chief Warden (Men’s Hostel) is responsible for allotment of student's accommodation as per the policy, arranging for the proper food in the Hostels, maintaining proper order and discipline in the men’s hostels. He may also award punishment to the students in case of indiscipline in the Hostels. He recommend improvements in the living facility of students to the comptetent authorities of the University. He reports matters related to indiscipline/neglect of duty caused by any of the Assistant Wardens or employees of the Hostels to the competent authorities for appropriate action. He implements the policy pertaining to Hostels as communicated from time to time by the Vice-Chancellor. Besides, being Chief Warden, he attends to his normal duties in his department, He prepares the budget every year for the Hostels in consultation with the Finance Comptroller for approval of the Board of Directors. The Chief Warden (Women’s Hostel) is responsible for allotment of student's accommodation as per the policy, arranging for the proper food in the Hostels, maintaining proper order and discipline in the women’s hostels. She may also award punishment to the students in case of indiscipline in the Hostels. She recommend improvements in the living facility of students to the comptetent authorities of the University. She reports matters related to indiscipline/neglect of duty caused by any of the Assistant Wardens or employees of the Hostels to the competent authorities for appropriate action. She implements the policy pertaining to Hostels as communicated from time to time by the Vice-Chancellor. Besides, being Chief Warden, she attends to his normal duties in his department, She prepares the budget every year for the Hostels in consultation with the Finance Comptroller for approval of the Board of Directors. The University has twelve hostels on campus, five for men and seven for women students including one Women's International PG Hostel. Single, double and multiple bed rooms are available in all the hostels. All the rooms are well furnished, ventilated and with WiFi Facilities. New International PG hostels for men accommodates foreign students. Note: Admission to any academic programme does not automatically guarantee accommodation in the hostel. Students from outside Allahabad are given preference for being accommodated in the hostels provided no disciplinary or police action has been taken against them. The mess provides a variety of nutritious and hygienically prepared meals for students residing in the hostels. There is a choice of non-vegetarian, vegetarian and South Indian food. Hayes Memmorial Mission Hospital of the University is equipped with experienced team of Doctors comprising Physician, Gynacologist, Opthamalogist, Orthopedisian, Surgeon, Anasthatist and Pathologist. The Hospital has OPD, IPD facilities, Pharmasy, Labs, X-ray & Ultrasound facilities, Operation theatre for minor and major surgery which caters the need of students, faculty members, officers, staff of the University and nearby area. Orthopedisian, Surgeon, Anasthatist and Pathologist. The Hospital has OPD, IPD facilities, Pharmasy, Labs, X-ray & Ultrasound facilities, Operation theatre for minor and major surgery which caters the need of students, faculty members, officers, staff of the University and nearby area.